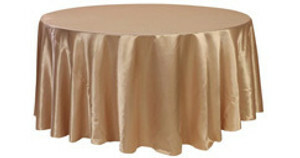 Satin tablecloths are popular in weddings and special events due to their glimmering, silky-soft beauty. These table cloths are affordable too! Our wholesale round and rectangular satin table linens here at Your Chair Covers feature serged edges and can be washed countless times. For round tables, we offer 120 inch round satin table covers for 60 inch or 5 ft round tables and 132 inch round satin tablecloths for 72 inch or 6 ft round tables. For rectangular or long tables, we offer 90 x 132 inch rectangular satin for 6 ft tables and 90 x 156 inch rectangular satin for 8 ft tables. Aside from that fact that they are fully drapable, wedding planners and fine-dining professionals prefer to use 120 inch rounds over other wedding linen tablecloths due to their durability and stain resistant properties. To complete your place settings, we also offer chair sashes, table runners, napkins and chair covers in satin.